Australia's Most Trusted Hardwood Pellet Manufacturer for heating. Available from our warehouses in Sydney, Melbourne, Newcastle & Woodburn. We can organise local deliveries. Australia’s Most Trusted Wood Pellet Manufacturer. Pellet Heaters Australia, premium hardwood pellets for heating. Available from our warehouses in Sydney, Melbourne, Newcastle and Woodburn. We can organise local deliveries. 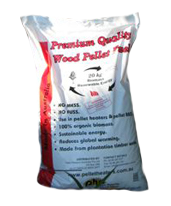 Hardwood pellets burn slower then softwood pellets. Hardwood Pellets reduce to just 1% Ash. Wood Pellet Heaters produce significantly less smoke & omissions then open fires. Manufactured from Australian Plantation Waste Timber. Pellet Heaters Australia has been producing pellets in Northern NSW since 2004. This is not a retail outlet but we do assist people & companies with pick-ups & deliveries every day. If you need help organising the delivery of any of our products then simply give us a call on phone 02 6682 2012. All pick-ups & deliveries should be by Richmond Street. What Makes a good Wood Pellet? What makes us the Best Company to deal with? Northern & Central Coast of NSW. In short if you need it we can get it to you fast. The burning of wood pellet fuel is carbon neutral, provided that forest resources are being managed and harvested in a sustainable practice – such as the use of sawmill residues from plantation timber. As trees grow they secrete carbon in into their wood structure, through the exchange of carbon dioxide for oxygen with the atmosphere. When trees die and decompose, the carbon is released to the atmosphere and soil through decomposition, maintaining a net neutral carbon balance in terms of the contribution to greenhouse gas concentrations in the atmosphere. Similarly, when wood is used as a fuel the stored carbon is returned to the atmosphere, largely through carbon dioxide and other gases, and the natural carbon cycle is maintained. Located on the beautiful North Coast of NSW, right in the heart of plantation timber country, Pellet Heaters Australia (PHA) has access to an excellent and abundant source of raw materials, all from sustainable & renewable sources of plantation timber. PHA produces a variety of products at our factory at Woodburn. Our main product is Premium Australian Hardwood pellet fuel for the domestic market. We also produce a range of custom spill absorbents for a number of companies in their packaging. The largest portion of our production is for the domestic market, with some products going overseas. Our plant produces and sells over 3000 tonnes of product annually. Situated on the main north-south Pacific Highway, with easy access to the main eastern cities of Brisbane, Sydney & Melbourne, we ship throughout Australia via truck. Our products are marketed in all capital cities.